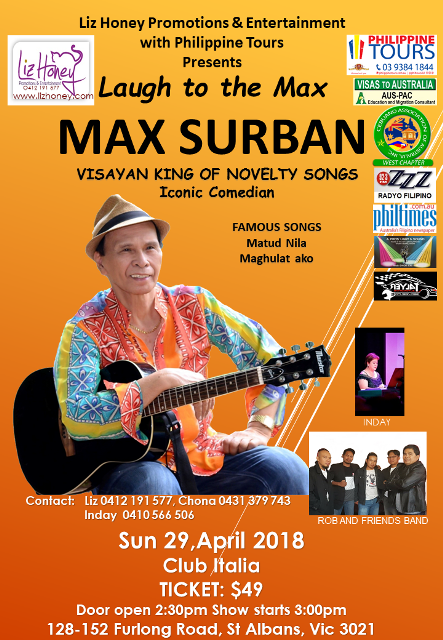 A relaxing evening of songs and romance as the celebrated singer/composer serenaded audiences anew with his familiar and much-loved compositions in a special one-night performance! 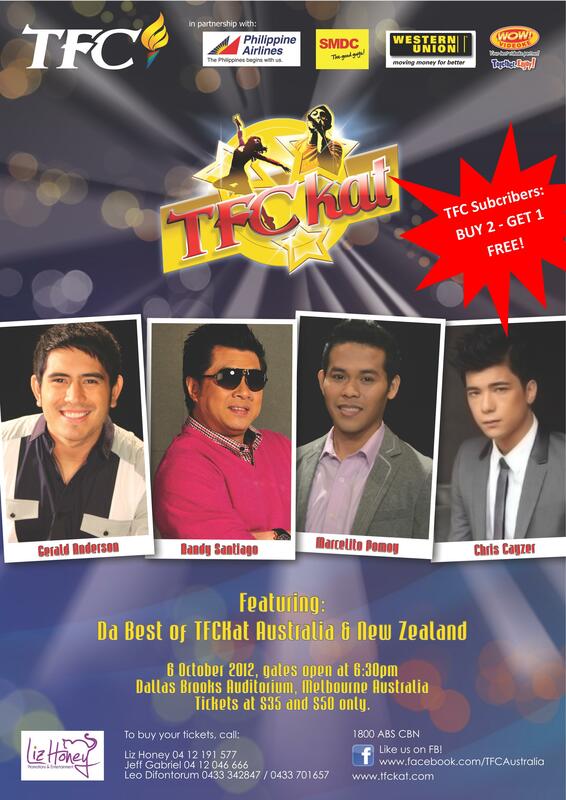 TFC's Australia & New Zealand grand final of their global talent search. Featuring Gerald Anderson, Randy Santiago, Marcelito Pomoy & Chris Cayzer. Congratulations to Australia & New Zealand Champion - Sean Hutton! RnB / Hip-Hop Dance and Singing competitions. 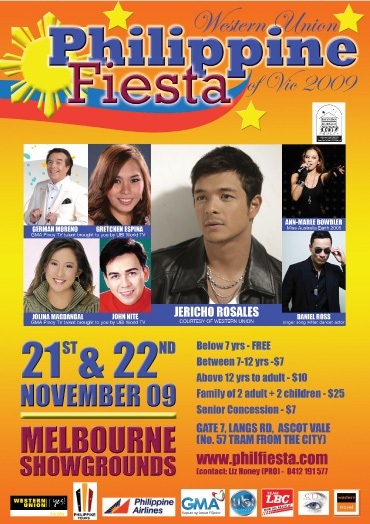 We were proud to sponsor the Philippine Fiesta of Victoria 2010. The event was a great success, despite difficult weather conditions. Thankfully the superb facilities at Melbourne Showgrounds kept the event participants safe and mostly dry. Proudly sponsored by Liz Honey Promotions & Entertainment. 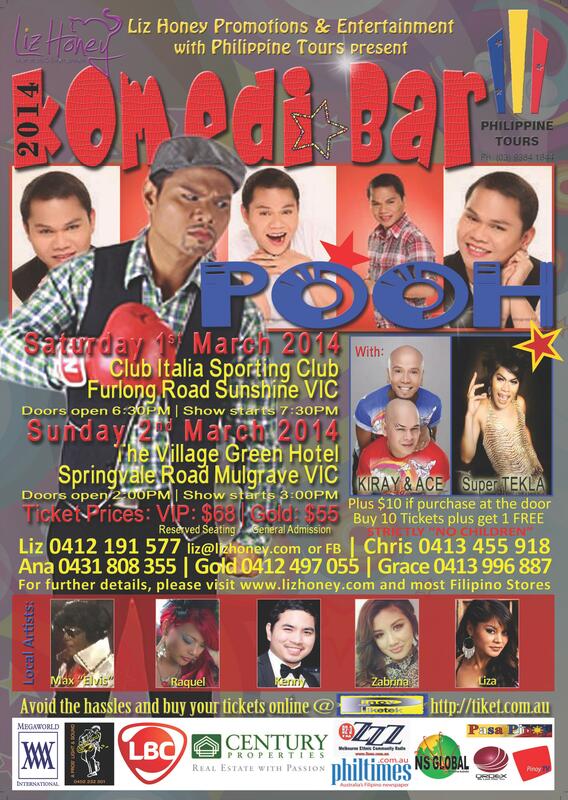 Proudly produced by Liz Honey Promotions & Entertainment. 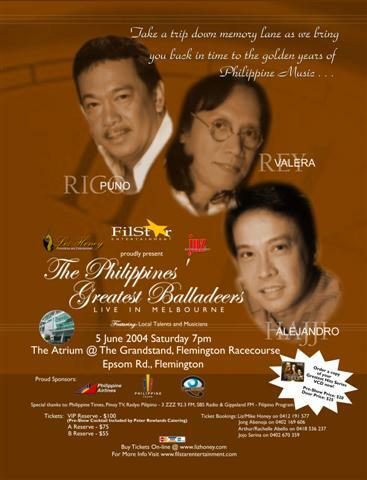 We were proud to sponsor the Philippine Fiesta of Victoria 2009. A highlight of the 2009 Fiesta was the upgraded venue, an improvement which Liz Honey proposed to the Fiesta Management Committee. 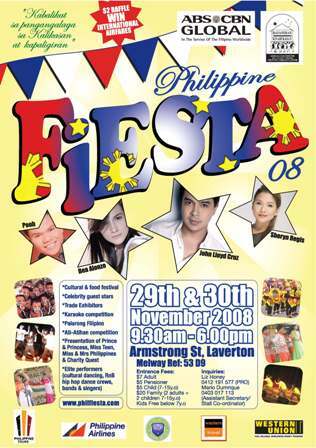 We were proud to sponsor the Philippine Fiesta of Victoria 2008. 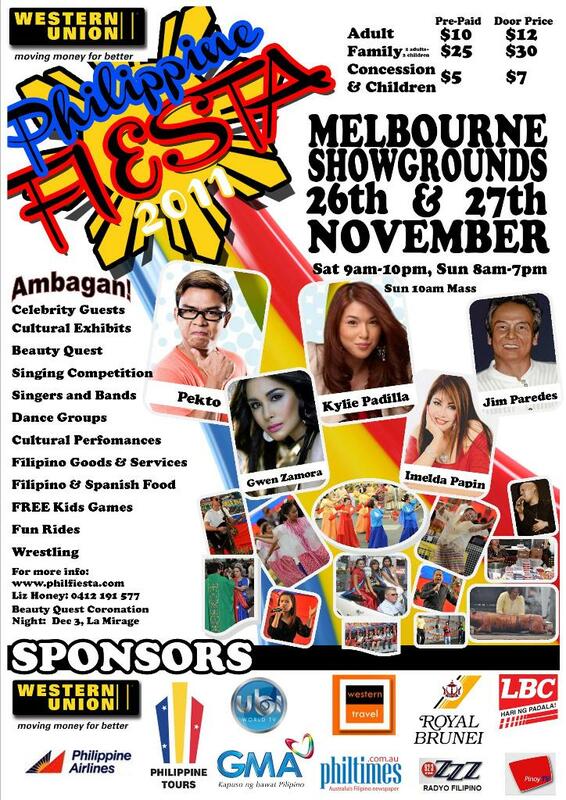 As well as special celebrity guests, this years event eatured trade exhibitors from the Philippines and Australia, International & Local entertainers, cultural and food festivals. 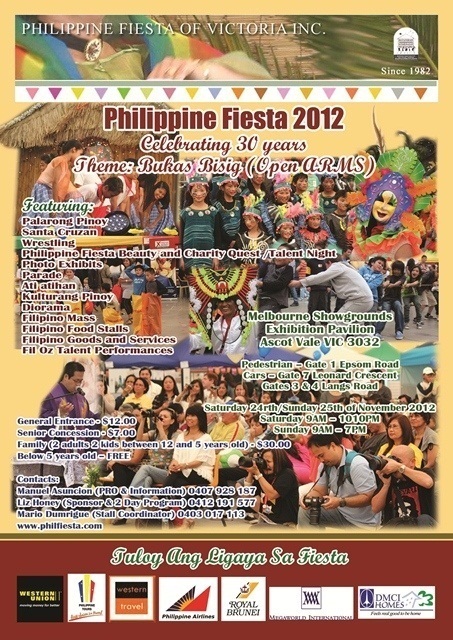 We are proud to support this 25th anniversary of the Philippine Fiesta of Victoria 2007 - "Akbayan". 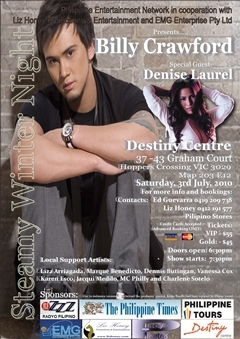 Proudly supported by Liz Honey Promotions & Entertainment. Event Pics are now available: Click Here. ... and dancers from ViKiNGs dance crew! Sitti's first ever international apperarance was a triumph! Her varied and and extensive performance delighted the packed crowd at Miss Libertine. 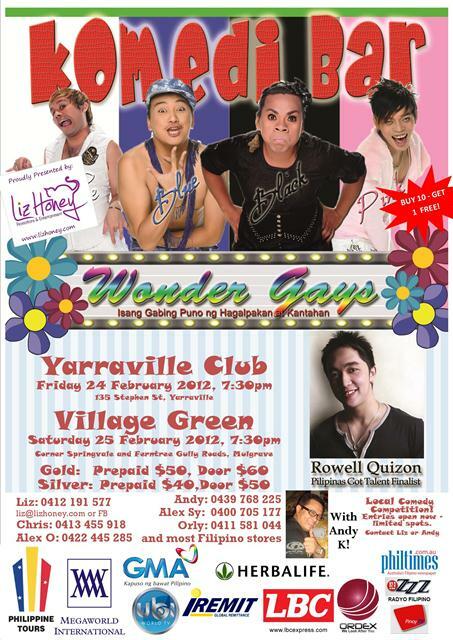 This event was sold-out - our apologies to those we had to turn away a the door. 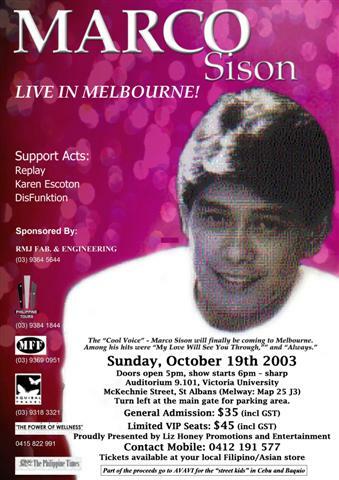 We hope to bring Sitti back to Melbourne for another event soon. 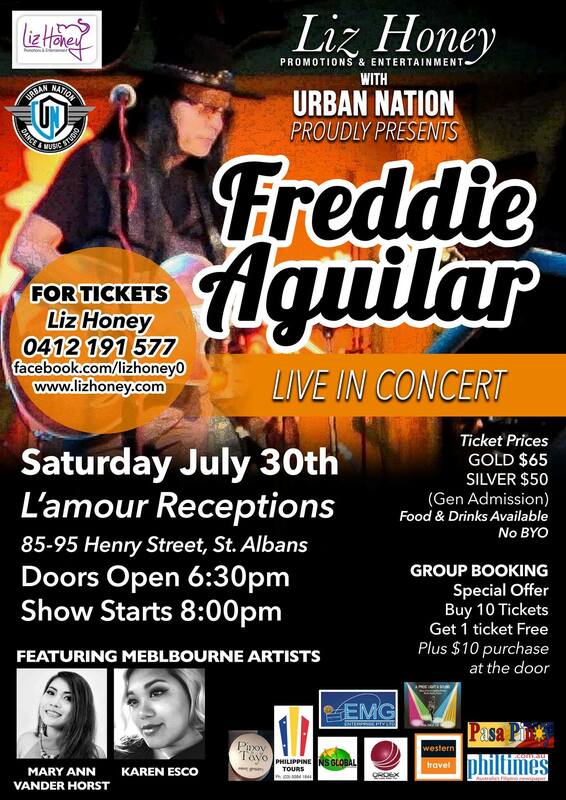 Produced by Liz Honey Promotions & Entertainment. 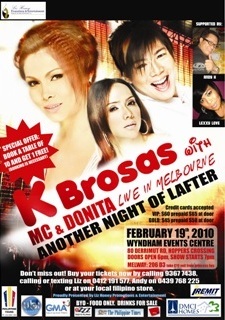 ... with their full Manila showband! 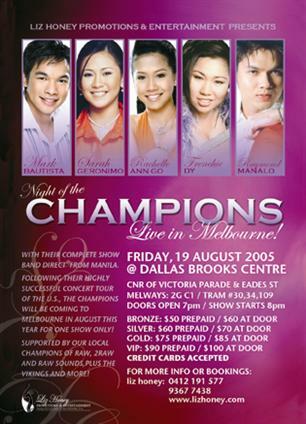 Return of the Champions: the most anticipated event of 2007! 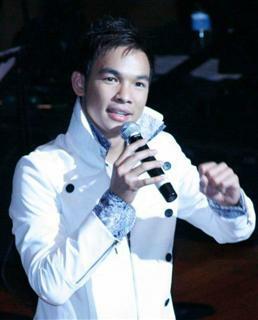 Dennis Butingan, owner of Cutting Edge Singing. ViKiNGs dance crew, hosts of the event. RAW Sounds 2005 Junior Champion Zabrina Araya with backup from Push It. Students & teachers from Urban Force Dance Studio. Our hard-working event crew (both backstage and front-of-house) made sure all the performers and audience were looked after and kept the show running smoothly and professionally. Thank you so much guys! Special thanks to the families and friends who came along - your support makes it all possible and also helps motivate our youth in positive directions. You encourage us to continue with more RAW events. Move over Beyonce! Stand back Ne/Yo! 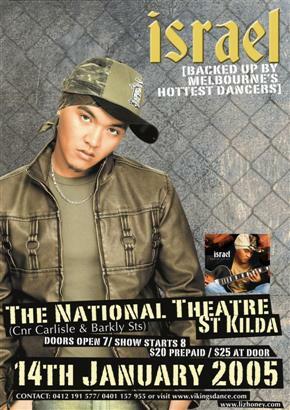 Melbourne’s hottest new RnB/Hip-hop singing talents graced the stage in the most electrifying competition yet – “RAW Sounds 2006”. 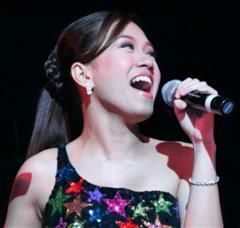 These singers no doubt rendered you speechless with their captivating voices in what was a packed-out event. Not only did these singers entertain with their voices, they also completed the show with Melbourne’s funkiest and freshest dancers! 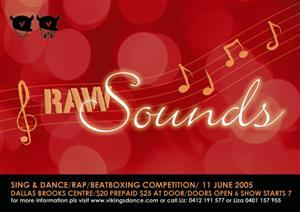 …“RAW Sounds 2006” - the ULTIMATE RnB/Hip-hop singing competition. Custom Designed Sportswear Voucher from Liz Honey Promotions & Entertainment, value $200. Studio hire voucher from Urban Force Studios, value $100. On behalf of NASA and MISCI, ViKiNGs Sports Club & ViKiNGs dance crew were proud to support the Filipino Interstate Basketball tournament that took place over Easter recently. ViKiNGs and other crews performed showcases to entertain the crowd and made for a great atmosphere. ViKiNGs ballers performed well, especially Lady ViKiNGs who were dominant. Crew from ViKiNGs Sports Club also helped to organise and run the tournament. 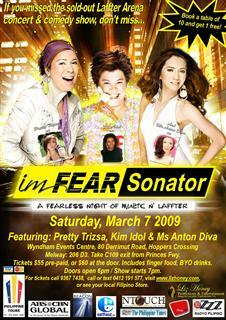 Liz Honey Promotions & Entertainment was a major sponsor. So thanks to all who took part or came along and made this a memorable event. 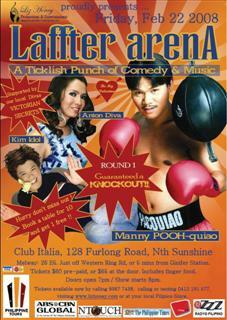 Supported by Liz Honey Promotions & Entertainment. These two Champion talents burst onto the scene from the "Star In A Million" TV show, with both their debut albums going Platinum. 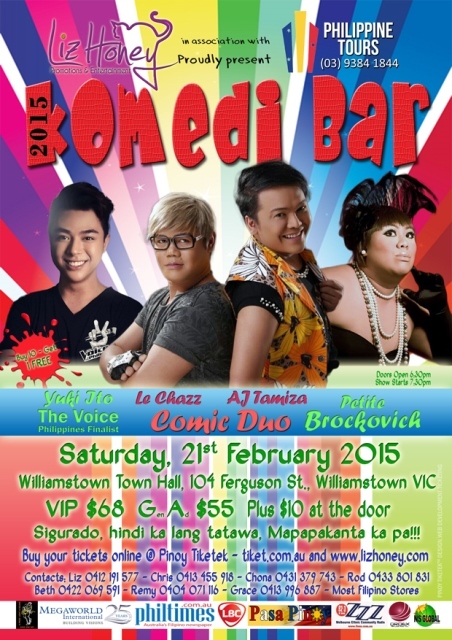 Don't miss their first performance in Melbourne, for one night only! We were very pleased with the standard set by these crews: they made RAW VIP the toughest RAW event yet! Unfortunately both B.O.C. (2RAW winners) and Yo Baby Pop (RAW 1st Runner Up) had members overseas and were unable to compete. RAW Sounds Champion Marque Benedicto with backup dancers Cracks Co (choregraphed by Vince from Rewind, and featuring dancers from Rewind, Vikings, Detour & more). 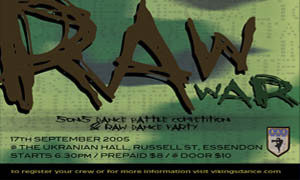 RAW and 2RAW brought out the best of the fresh new crews – and they got their names on the VIP list – for “RAW VIP”. RAW VIP put the top new crews (the winners from our previous RAW and 2RAW dance comps) against the top experienced crews invited by ViKiNGS, from Melbourne and interstate. 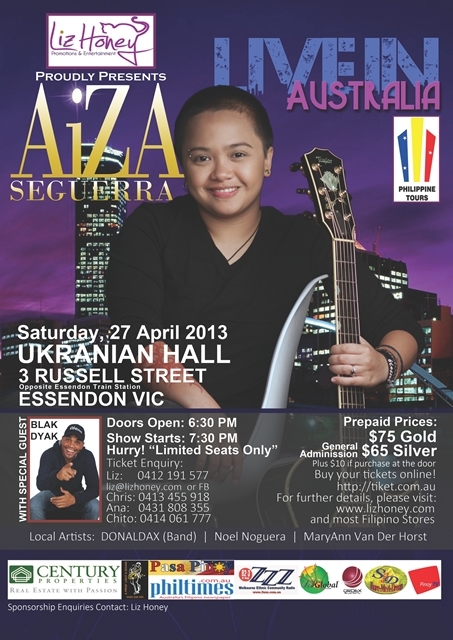 2 week VIP pass to dance classes at Melbourne Music Academy, value $300 per person. Custom Designed Sportswear Voucher from Liz Honey Promotions & Entertainment, value $500. 5-on-5 RnB/Hip-Hop dance battle comp. It is also host to a Hip-Hop dance party inviting everyone to have fun and dance. Crews get ready for battle in the next 5-on-5 team comp: “RAW WAR”. “RAW WAR”: take no prisoners! Click here to check out how the RAW WAR championship unfolded. 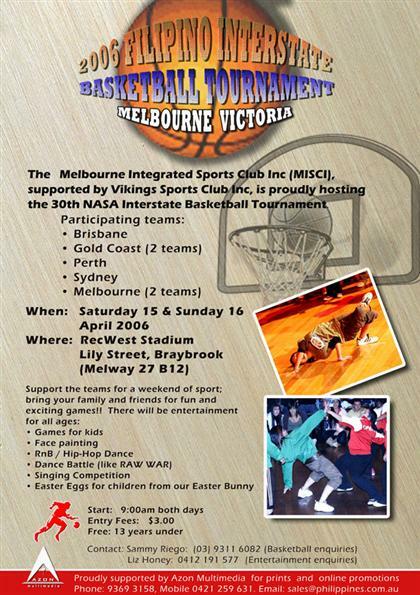 RAW WAR raised $1,000 for the “Melbourne Inter State Sports Club”, in support of the basketball tournament they are hosting during Easter 2006. Event Pix are now available: Click Here. 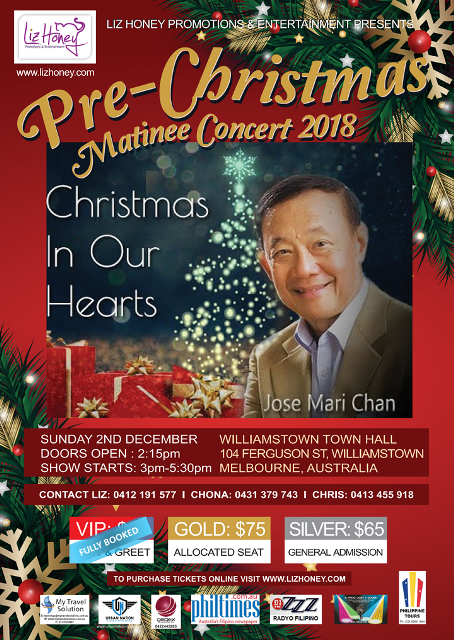 After sold out shows at the Araneta Coliseum in Manila and across the USA, it was Melbourne's turn to experience the excitement of: "Night of the Champions". 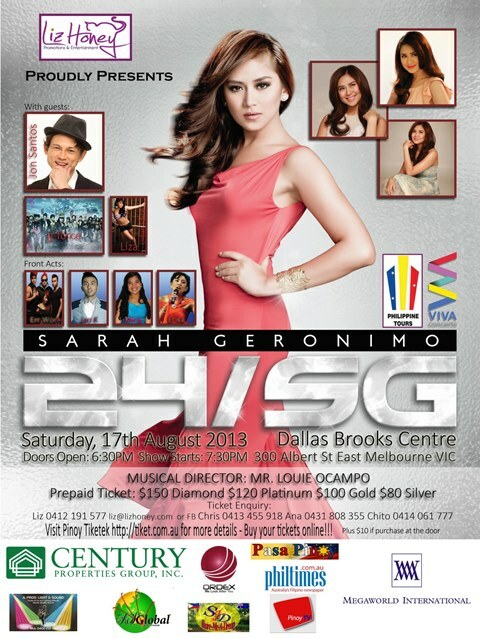 These exciting young talents represent the future of Filipino entertainment. 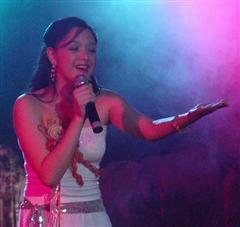 They were all finalists in the top singing contest TV shows in the Philippines. As a bonus, they bought their full Manila showband to Melbourne, featuring renowned Musical Director Mr Mark Lopez. RAW Sounds was another massive event. The fresh concept of bringing singers to work together with dances in an R&B / Hip-hop comp brought out some stunning creativity. Our congratulations go to all the competitors - they blew us and the audience away with their RAW talent and enthusiasm to perform. Thank you all for the great show. 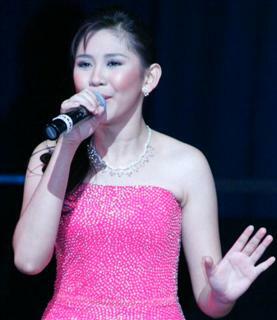 It just proved that there are a lot performers that were just waiting for this big chance. That's what RAW Sound is all about. We are giving those people a unique experience and exposure. We can't wait to see what they can achieve in the future. 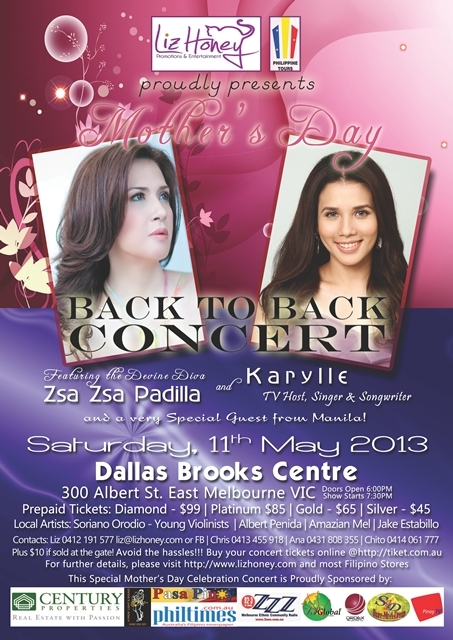 Their performances combined with the great auditorium at the Dallas Brooks Centre and the professional sound & lighting to make a very entertaining event. 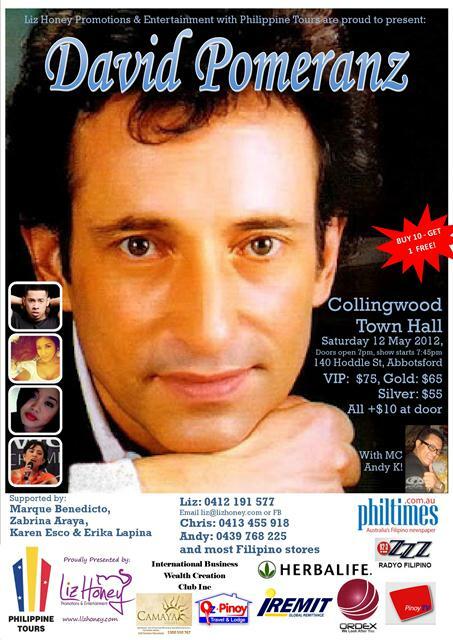 The success of this event has encouraged us to plan a follow up event, probably early 2006. 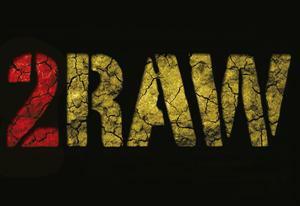 So watch out for RAW SOUNDS 2. I hope everyone enjoyed RAW Sounds as much as I did. I watched most of the performances and everyone demonstrated their full potential. I am very proud of you ALL and I am filled with joy to see each group perform full of confidence and giving their best on the night. I'm sure your supporters are all proud of you as well. It takes a lot of courage to get up in the spotlight in front of of so many people. You've shown your talent, creativity, team work and enthusiasm. Congratulations to all of you Singers and Dancers, and extend my thanks to your families & supporters who made this event possible. 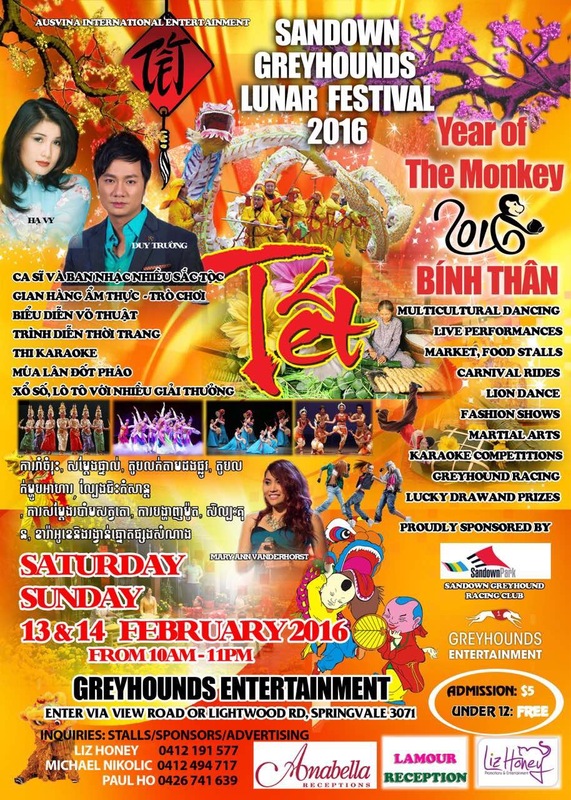 To all our dedicated & hard working crew - well done for another professional-quality event. To read more about the our objectives for this event, please read this: RAW objectives. Move over Beyonce! Stand back Usher! Melbourne’s hottest new RnB/Hip-hop singing talents are gracing the stage in the most electrifying competition yet – “RAW Sounds”. 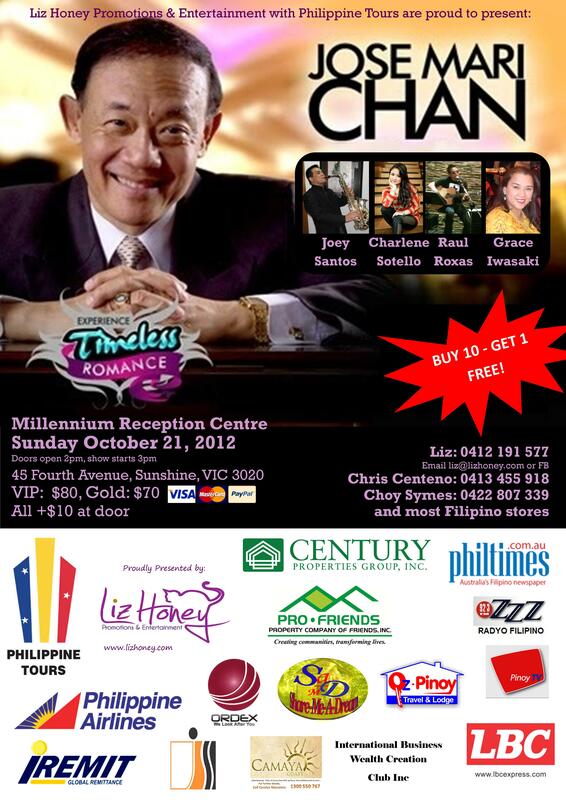 These singers will no doubt render you speechless with their captivating voices in what promises to be a sell-out event. But wait, there’s a catch. 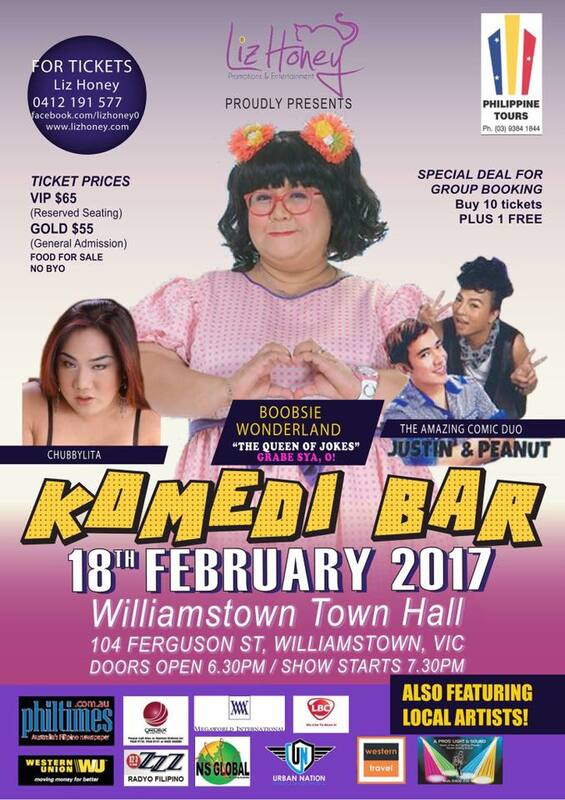 Not only will these singers entertain with their voices, they must also complete the show with Melbourne’s funkiest and freshest dancers! Singing AND dancing. Can it get any better? Actually it can. 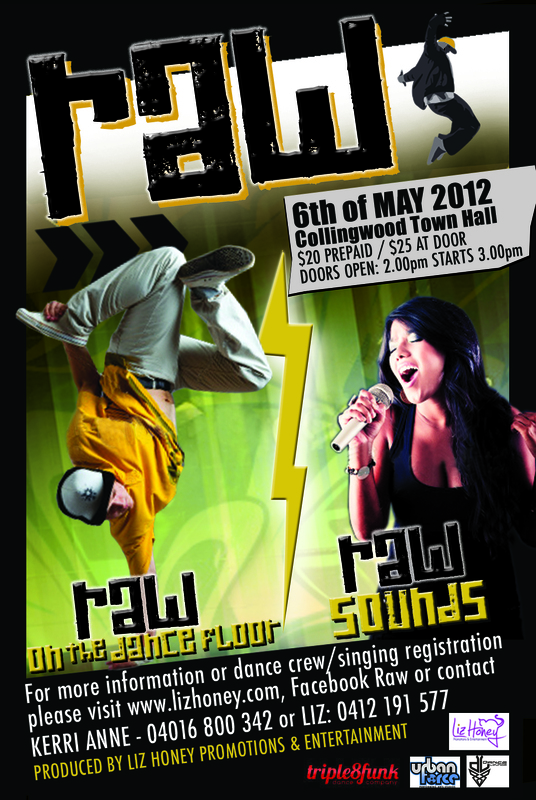 “RAW Sounds” will further be hosting a competition for all those MC’s and beatboxers with the talent that astounds many. 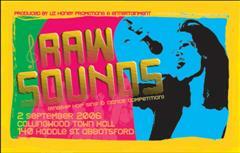 …“RAW Sounds” will be the ULTIMATE RnB/Hip-hop singing competition. 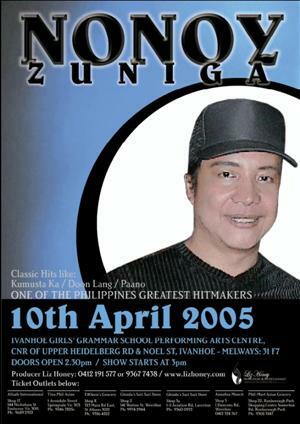 Nonoy Zuniga is a true legend of the Philippine entertainment scene. 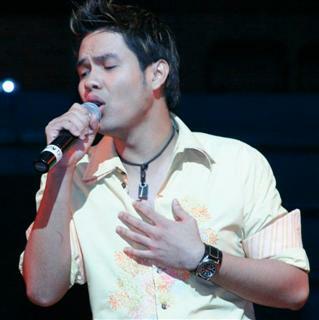 In 2004 he joined with Rico J Puno, Hajji Allejandro, Ray Vallera and Marco Sison to form "The Great Hit Makers", performing to capacity crowds in Manila and around the world. In December it was Nonoy who sang "Doon Lang" as FPJ was laid to rest in Manila. 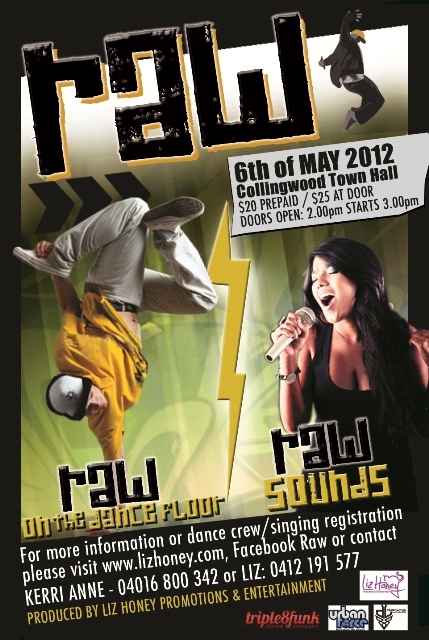 2RAW was another totally packed-out hip-hop/funk dance comp, which succeed in bringing out the freshest, rawest crews to compete. The atmosphere was intense as 13 crews gave their all, while KStar Evolutions COMBUST, NJ Raimundo, Funkey Fresh and of course ViKiNGs delivered ground-breaking showcases. All that was followed by the hottest Battle comp yet. 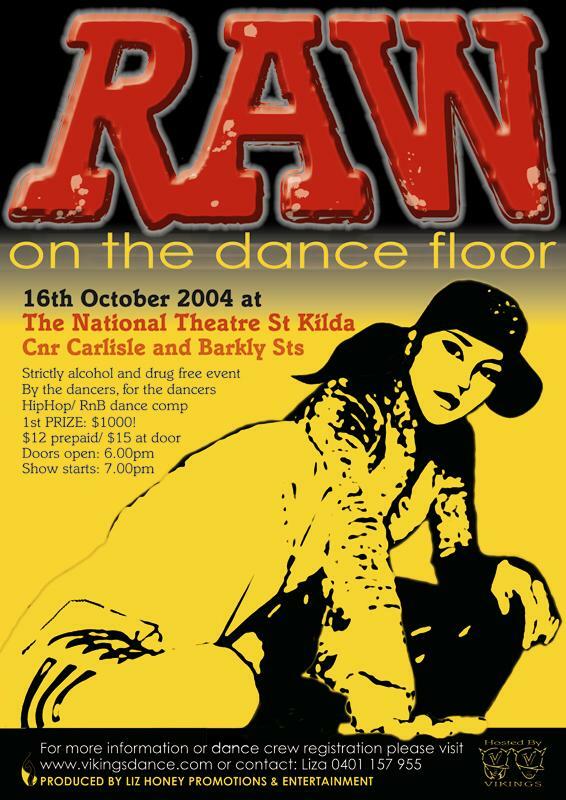 The 2RAW competitors were: B.O.C., 'Diverse, Filosophy, five [one] nine, HYPE, Ignite, Kazzum, Raydar, Soul'd Out, Three-Sixty, Virus, X-Cape and X-Quisit. Twenty two year old Israel has been on a long and sometimes difficult journey to reach where he is today. But rather than dwelling on the negative, Israel uses his past as motivation for his future. With an unshakeable faith in his destiny Israel has spent seven years immersed in music, resulting in a catalogue of 450 songs, music publishing, recording deals and his debut single "Wake Up With You" and debut album 'Chapter 1"
This event presented Israel’s perspective on his journey through the music industry, in a full-length concert/musical production that blended Israel’s original music, dancing and drama. Israel was backed up by rappers KA$H and Vallerie. Melbourne’s hottest dance crews were dancing back up for Israel, as well as acting : Detour, Funkey Fresh, Platinum, Replay, Rewind and of course ViKiNGs. We are so proud of the show we put together with Israel, his crew and all the other people involved. Feedback on this event was so positive, including: "I was brought to tears". Let us know what you thought. 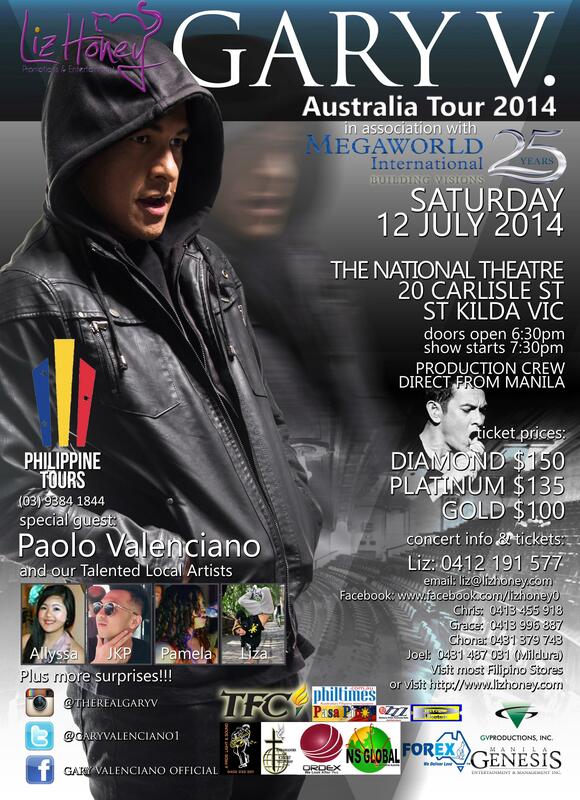 Guess who will be dropping in from overseas as a special guest artist? 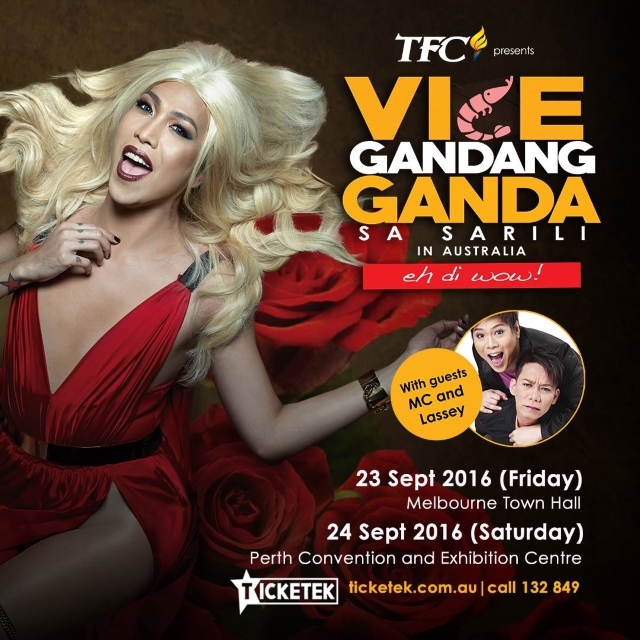 Vice Ganda, renowned Manila singer/comedian. 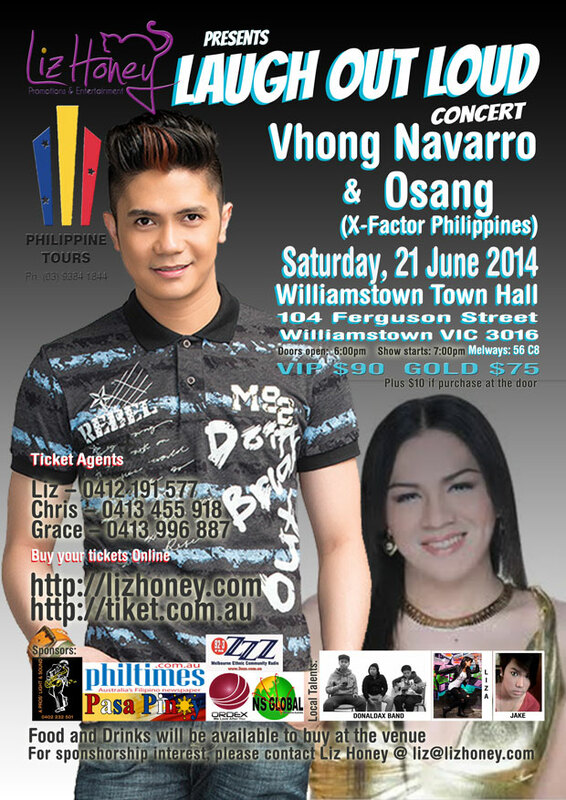 Proudly supported by Liz Honey Promotions & Entertainment. 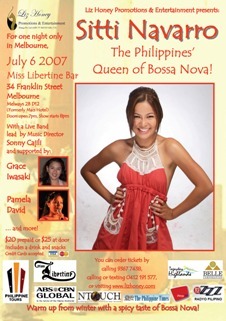 Liz Honey is Chairperson of the Miss Philippines of Victoria Quest 2004. Thank you so much to everyone who made the RAW event such a success! Our apologies to all the people who couldn't get in as this all-seated event was a sell-out. Please get your tickets early next time. Choreographed by Karen Jehodo, this opening showcase by 70 of her dance students set the event on fire! The event video is now available on DVD - only $18. Please contact us if you are interested in a copy. 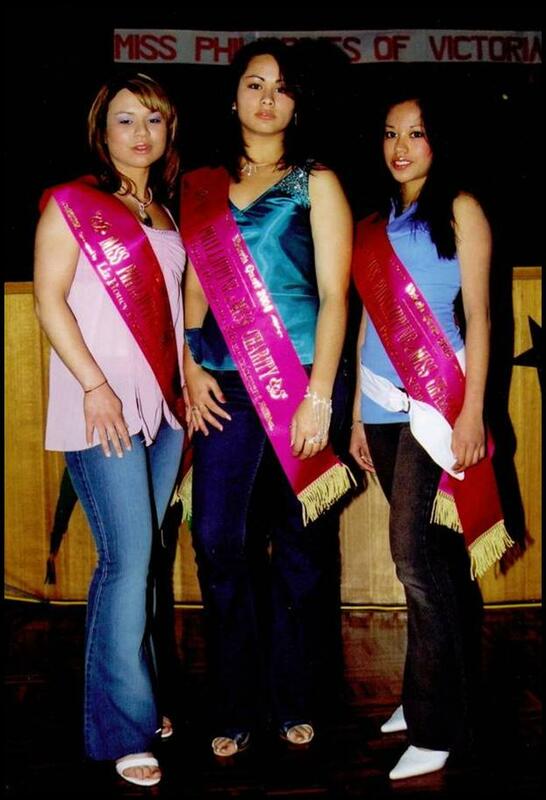 and their Miss Teen Philippine Victoria Quest 2004 project. Copyright © 2015 Liz Honey Promotions & Entertainment. All Rights Reserved.